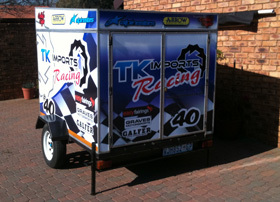 With custom made vehicle signs, your vehicle could be one of the best sales tools you already have. 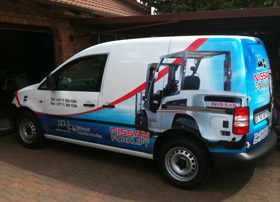 Simply by utilizing your vehicle for everyday duties in the East Rand, Gauteng area, whether you are driving it, or it just been parked in strategic locations, you could be reaching thousands of prospective customers per day without even thinking about it. 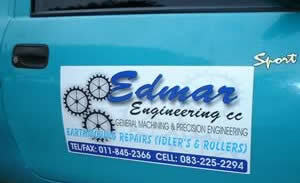 For extremely cost effective exposure of your business, advertising with vehicle signs is the solution! Vehicle branding has many options including vinyl cut lettering, magnetic signs, full colour, digitally printed and partial and full vehicle wraps (where the vehicle is partially, or fully covered with digitally printed graphics) and contravision (perforated window vinyl) applied strategically to the windows of your vehicle. Vehicle branding by Crystal Signs, utilizing full and partial wrap signage, will help you to send your message out to thousand of perspective customers in a dynamic way. The wrap vinyl moulds to the vehicle like a second skin, protecting the original paint finish whilst creating a mobile masterpiece. On the highway or around town, prospective customers will see your vehicle branding from afar, be instantly aware of your range of services, and have a phone number to call for more information. 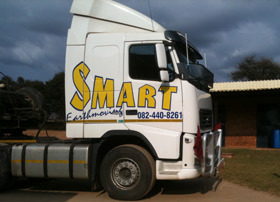 Vehicle Branding That Gets You Noticed! The next time you’re driving around town, take note of how many times you find yourself reading eye catching vehicle wraps, or in many cases, reading the contravision signage on the back window of a vehicle as you are sitting in traffic. Pictures speak a thousand words, so having photographic images of your product or services will greatly enhance customer awareness. 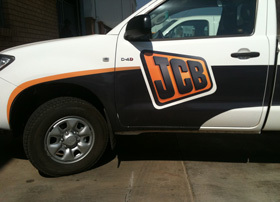 Call today or Click Here for a free quotation for your vehicle branding requirements. Vinyl cut lettering and graphics for vehicle signs has proved to be an effective alternative to conventional, hand painted signage. The utilization of computerized vinyl cutting equipment, by Crystal Signs, has allowed us to offer our clients affordable, super neat vehicle signs applied to their vehicles more conveniently, due to less down time from having to wait for their vehicles to be ready. 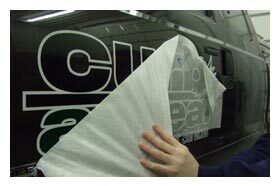 The vinyl cut lettering we use is also removable and does not damage the vehicle’s paint surfaces. Vinyl cut lettering and graphics are also very convenient, especially if information such as telephone numbers, product names, etc. need to be changed. The vinyl is available in a myriad of colours and speciality designs that will match just about any corporate colour specification. The vinyl cut lettering and graphics can be applied by yourself or installed by our experienced installation team. 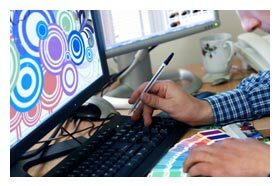 Click Here to request a free quotation today for your vinyl cut lettering and graphics requirements. Perforated window film or Contravision is an excellent choice and very popular for vehicle signs, where digitally printed graphics printed on our large format printing machine, are applied over rear and side windows. This type of vehicle vinyl decals has hundreds of tiny holes in it’s surface and a dark backing which allows the vehicle occupants to “look through” the window graphic without impeding visibility. From a distance, the holes when viewed from the outside, are barely noticeable and the graphic appears solid. Perforated window film graphics are highly effective as they are above the vehicle’s door panels and easily visible to other motorists sitting in their vehicles. The graphics are trimmed to the contour of the window panel for a neat presentable finish. By using Perforated window film, your rear window or rear side windows become instant attention grabbers that can generate more sales for you. Our in house design team and printing equipment can quickly have your contravision signs on your vehicle and getting you incredible exposure to your potential clients. Call us today for more info on 011-823-1822 or Click Here to send an email. 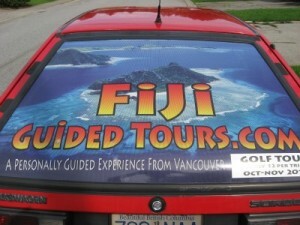 Magnetic signs are a great choice, if you don’t want to have graphics permanently applied to your vehicle. If you use several vehicles, you can simply switch the magnetic signs graphics to the relevant vehicle. 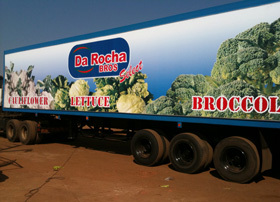 Magnetic truck and car signs can also be custom shaped to enhance your corporate design. Crystal Signs can produce a full colour “rolling advert” for your business that can be easily attached to your vehicle doors or side panels. Being magnetic, these panels would not be suitable for aluminum or fibreglass body panels. Magnetic signs are an affordable option and can reap dividends by giving your business the exposure it deserves. 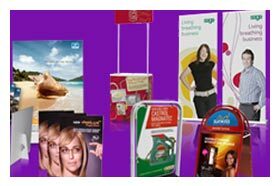 Magnetic signs are available in a range of sizes and can even be profile cut to a specific shape if required. Call us today and start using magnetic signs as an effective, low budget way to get your product or service seen by thousands of potential customers. Our Vehicle signs service covers a range of vehicles including cars, trucks and vans, motorcycles, aircraft, boats and buses. Your vehicle can literally become an asset overnight as it begins to attract new customers to your business. Vehicle advertising can pay for itself in no time at all. Give Crystal Signs a call and ask us how our custom made vehicle signs can increase your company awareness. 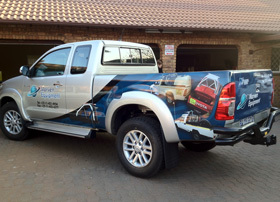 Contact Us Today on 011.823.1822 or Click Here to request a free quotation for all of your vehicle signs and graphics requirements.